I had last Friday off and it was a nice day so I decided to take the kids outside for some birdwatching and fishing. The fishing part of the trip was ultimately unsuccessful, but we did have some success locating our target for the birdwatching venture, the American dipper. 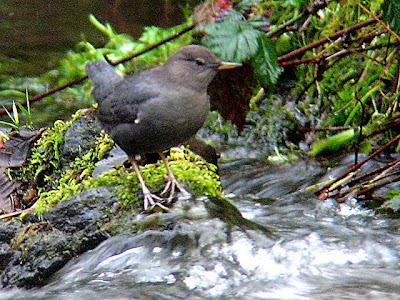 While they aren't all that flashy looking like some other birds, dippers are interesting in that they survive almost exclusively on bugs and sometimes very small fish that they catch from fast-moving, cool streams. In the Black Hills, dippers are currently limited almost exclusively to Spearfish Creek and its tributaries as other historical habitat has been rendered unsuitable by dams and other stream alterations that slow down and warm up streams. In fact, the Black Hills population of dippers is so rare and so removed from the next nearest population (in the Bighorn Mountains of Wyoming) that a petition was recently submitted to the U.S. Fish and Wildlife Service to list the Black Hills dipper as a separate subspecies and to add it to the Threatened and Endangered species list. Genetic studies have recently been conducted that seem to confirm that the Black Hills dipper has become genetically distinct from other populations, but the initial finding from USFWS is still pending. At work on Wednesday, I went on a field trip with some biologists from across the Black Hills National Forest to visit some of the dipper nesting sites in Spearfish Canyon and to discuss their status and potential recovery actions should they be listed (and just to get out of the office in general). For the most part, dippers are fairly tolerant of humans and you can get pretty close to their nests without totally freaking them out. One nest in particular offered a great view of the adults feeding the nestlings inside and I thought the kids would get a kick out of it, hence our return there on Friday. Dippers prefer to build their nests directly over water. They will readily use man made nest boxes and, in fact, data on the Spearfish Canyon population shows that only 30% of the nesting pairs built their nests on natural surfaces. The nest I took the kids to was one of the natural ones. Dippers construct a sort of dome structure out of moss and grass with an opening facing the stream. Inside the dome they also construct a more "traditional" nest to lay their eggs in. The same pair will reuse the same dome from year to year, but always rebuilds the internal nest. We had a short hike up to where the nest was located on a cliff face directly above the stream. As soon as we approached the nest, I spotted one adult dipping in the stream for food and within five minutes the kids were able to watch the adult fly up to the nest, got to see three hungy beaks pop out, and watch the adult feed them before taking off to look for more. Caiden and Chloe were pretty impressed by this, but also got bored with it fairly quickly. I attempted to get a picture of the adult actually feeding the nestlings, but there were too damn fast, but I did get a shot of the nestlings begging for food. So, all in all a good trip. No fish, but we did get to see a cool bird and, on the way to the nest, also saw this smooth green snake on the trail. It's definitely spring in South Dakota. Nothing saves a slow day of fishing like a dipper spotting, especially when they are feeding nestlings! Have you come across any red-headed woodpeckers in the Black Hills? I hear they like wildfire sites. Funny you should ask about red-headed woodpeckers, Max, because I just saw two of em yesterday while I was running. They weren't in a burn area, but they do seem to favor one particular road just outside of town and I'm not sure why. I see them along the same stretch every summer. During my 23 mile run yesterday I also spotted horned larks, bobolinks, eastern kingbirds, a road-killed sharp-shinned hawk, tons of red-winged blackbirds, and a few turkey vultures (not a comforting sight when you're near the end of a long run).